They’re perfect for your game-day appetizer table, or as something different for Taco Night. 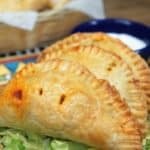 Serve the taco hand pies with a side sour cream and plenty of hot sauce. Then, wash it all down with this amazing homemade margarita. Add the chili powder, salt, garlic powder, onion powder, cumin and black pepper in a small bowl, stir to combine well. Set aside. Heat the canola oil in a large skillet over medium-high heat. Add the ground turkey to the skillet, sprinkle with the prepared seasoning mix. Stir, to mix well. Cook the ground turkey until browned, approximately 4-5 minutes, stirring frequently and breaking up the ground turkey with a wooden spoon or spatula. Add the black beans and corn to the taco meat and give everything a good stir. Cook, covered just 3-4 more minutes so all the flavors come together. Take the skillet off the heat, uncover and let the taco filling cool a bit. Once it has cooled, place it in a large bowl and refrigerate while you prepare to make the hand pies. Remove the pie crusts from the refrigerator 15-20 minutes before using. Prepare a small bowl with the egg and 1 tbsp. of water, beat well with a fork. Cook’s Note: To make the pie rounds use a large biscuit cutter or, I use an empty 28 oz. can with both ends removed. Sprinkle a little bit of flour on a large cutting board or a clean surface. Lay out one pie crust dough. Using the can or biscuit cutter, cut out the rounds. Roll it gently to make each round just a little thinner and a little larger. Re-roll the dough scraps, flatten to roughly the same thickness of the original and cut out the remaining rounds. Working with one round at a time, add a tablespoon of taco filling in the middle of the round. Add a pinch of cheese and a pinch of the sliced green onions. Using a pastry brush (or your finger) moisten around the edges of the dough with the egg. Fold the dough round in half, press the edges together gently. Crimp the edges using a fork. 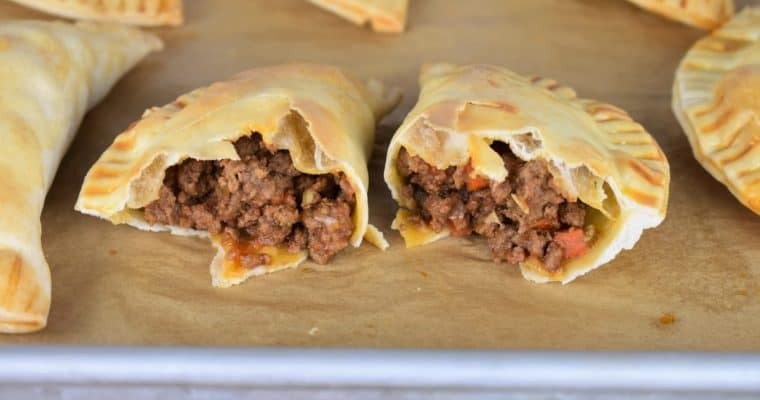 Place the taco hand pie on the parchment paper lined baking sheet. Repeat with the remaining ingredients. Brush the top of the taco hand pies lightly with the egg. Make 2-3 small slits on the top of each hand pie, use a paring knife. 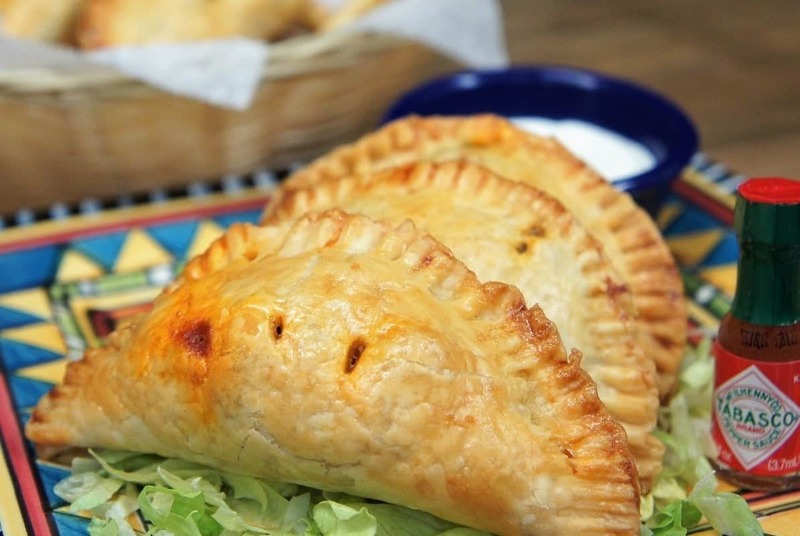 Bake the taco hand pies for approximately 15-25 minutes, until they are a nice golden color. Check them after the first 15 minutes, then add 5 minutes at a time until they reach the desired color. If you have any remaining taco meat, refrigerate. Use the leftovers to make a couple of soft tacos for lunch or make a great Southwestern Taco Salad. 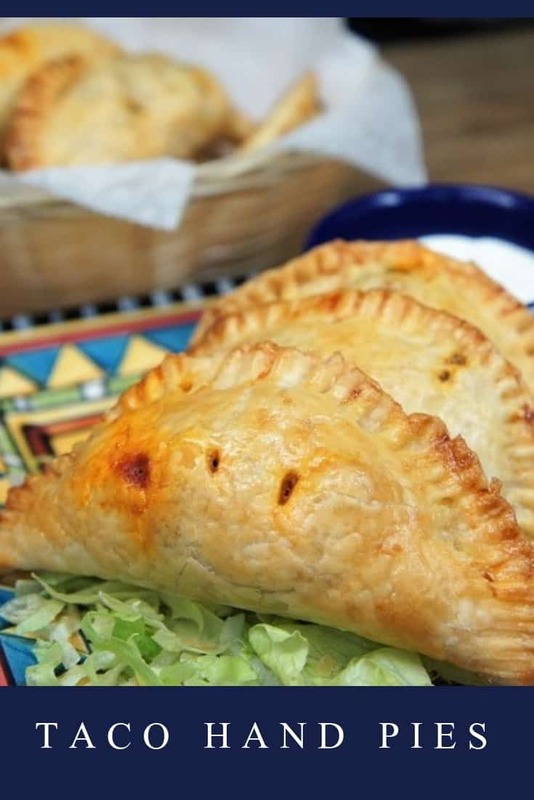 These hot and flaky, hand pies are filled with a delicious and flavorful taco filling. They’re perfect for your game-day appetizer table, or as something different for Taco Night. 1 box Refrigerated Pie Crusts 14 oz. Add the chili powder, salt, garlic powder, onion powder, cumin and black pepper in a small bowl, stir to combine well. Heat the canola oil in a large skillet over medium-high heat. Add the ground turkey to the skillet, sprinkle with the prepared seasoning mix. Stir, to mix well. Cook the ground turkey until browned, approximately 4-5 minutes, stirring frequently and breaking up the ground turkey with a wooden spoon or spatula. Add the tomato sauce and 1 tbsp. water, stir well to combine. Lower the heat to medium-low, cover and cook about 15 minutes, stirring occasionally. Add the black beans and corn to the taco meat and give everything a good stir. Cook, covered just 3-4 more minutes so all the flavors come together. Take the skillet off the heat, uncover and let the taco filling cool a bit. Once it has cooled, place it in a large bowl and refrigerate while you prepare to make the hand pies. Remove the pie crusts from the refrigerator 15-20 minutes before using. Prepare a small bowl with the egg and 1 tbsp. of water, beat well with a fork. Make the pie rounds, use a large biscuit cutter or, I use an empty 28 oz. can with both ends removed. Sprinkle a little bit of flour on a large cutting board or a clean surface. Lay out one pie crust dough. Cut out the rounds. Roll it gently to make each round just a little thinner and a little larger. Re-roll the dough scraps, flatten to roughly the same thickness of the original and cut out the remaining rounds. Working with one round at a time, add a tablespoon of taco filling in the middle. Add a pinch of cheese and a pinch of the sliced green onions. Bake the taco hand pies for approximately 15-25 minutes, until they are golden. Check them after the first 15 minutes, then add 5 minutes at a time until they reach the desired color.